It's very important to prepare the soil properly for growing great, large, good-tasting bulbs of garlic. First, you need to know what kind of soil you have--and conducting a soil test is perfect for that. It can help you determine if you have the best soil for garlic--and if not, how to make it better. If your soil isn't perfect, never fear. Garlic is a very forgiving plant that can do well even in marginal soil. Fertilizing with organic fertilizers like manure and alfalfa and using cover crops to build fertility can help poor soil, so don't let it stop you from growing garlic. Wet feet: Garlic does not grow well in standing water. It will tend to rot if it has wet feet for too long. To solve this problem, try growing it in raised beds, and/or increase sand and organic matter in the soil. "Dirty" bulbs and more work to harvest: Clay will tend to cling to the outer paper garlic skins. This will be cumbersome to remove and may stain the outer wrappers. It can also make harvesting garlic more difficult, especially if the ground is dry and the clay has hardened. pH: Between 6.0 and 7.5 is the ideal pH for growing garlic. Nitrogen: Garlic needs more nitrogen than most farmers think, mostly during its initial growth phase as it emerges and spreads its leaves. Adding organic manures, such as cow and poultry, are a great way to add nitrogen. Phosphorus: Phosphorus is needed for optimal root development. Potassium: Enough potassium is critical for leaf growth and healthy bulb formation. Sulfur: Sulfur compounds are directly related to garlic's unique healing benefits and flavors. To add sulfur, sprinkle gypsum over your beds in the spring, after the plants have emerged and begun to leaf out. When adding manure, use caution. You do not want to add manure too close to harvest time. Organic certification usually requires applying it no sooner than 120 days before harvest. Antibiotics, drugs, and GMO residue from animal feed take time to break down in the manure. Three weeks prior to planting, we have our fields sprayed with about 15,000 gallons of liquid cow manure (on two acres of fields). We spray the field we're about to plant as well as the field that will be planted the following year. In three weeks, the smell has dissipated enough that planting is not an odious chore, and it also lets the nitrogen settle so that it doesn't shock the cloves when planted. Be sure to turn under the liquid manure after spraying so that the nutrients don't evaporate. We use a disc on our Kubota to mix the manure with the soil. Poultry manure, such as chicken manure, has also worked well for us. It's the most concentrated source of nitrogen of any manure, at least that we've heard of. Buying or using organic manure is best if you can manage it because there are so many chemicals and GMOs used in feed these days. Poultry manure doesn't evaporate like cow manure, so it doesn't need to be turned under as quickly as cow manure, but it's still important to mix it into the soil before planting...especially since that nitrogen is so concentrated. Composted horse manure can be a good source of nitrogen as well. Make sure you know what, if any, drugs have been given to the horses, as whatever they have been given will typically be shed in their manure and go right into your precious soil. Another technique that can be helpful is amending your soil with alfalfa. We use alfalfa pellets because they are cost-effective, easy to apply and organically appropriate. We first learned this technique from Boundary Garlic and adapted it to work best for our farm. 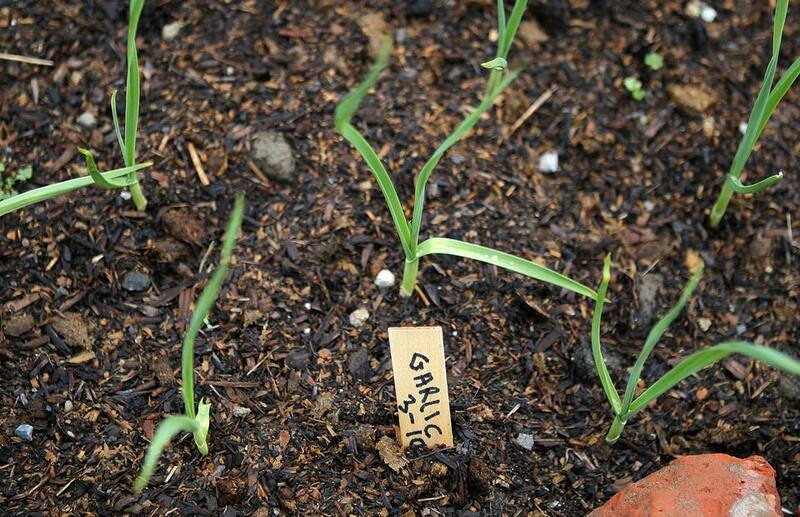 Garlic needs room to spread its feet, so you need to loosen your soil before planting. We are not huge fans of conventional tilling, but we find it necessary to prepare to plant cloves. We use it as little as needed; just two times immediately prior to planting. Since we use a three-year rotation for our fields, we till any given bit of land once (well, twice, but within 3 weeks) every three years. The spader: This is a tractor-mounted, PTO-driven implement (but you can get a walk-behind unit as well) used widely in Europe, but rarely seen in the US. It works by digging deep with six-inch-wide spades, then turning over the soil. It shatters compaction up to two feet deep but leaves the delicate microbiology of your soil intact. Compost tea: A healthy soil is simply teeming with ​microorganisms - bacteria, fungi, yeasts and more - that create an intricate, living web. Traditional cultivation and fertilization damages this web. Compost tea helps restore it. We have a 1,100-liter tea to our fields at least twice each year to help rejuvenate the soil microbiology. Cover crops: Also known as "green manure," cover crops can add nutrients to your soil as well as help loosen the soil with their powerful root system. See which cover crops are ideal for loosening soil.